I love that subtitle - 140+ new recipes, clever ideas and speedy solutions for every day. 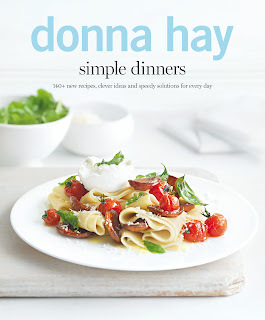 It sums up perfectly this scrummy new book from Donna Hay.And I have to say I want to make everything in here! I have already made three main course dishes and all were a great success. I am a great fan of Donna Hay, I remember when she used to be the cookery writer for Marie Claire magazine, and now of course I watch her weekly on tv. The recipe that appears below is the cover recipe so you know how it should end up looking. Mine didn't look quite that good! Preheat oven to 200°C (400°F). Heat the oil in a small saucepan over high heat. Carefully add the basil leaves a few at a time, as they may spit, and fry until crisp. Drain on absorbent paper and set aside. Place the chorizo and tomato on a baking tray lined with non-stick baking paper and roast for 15 minutes or until chorizo is golden. While the chorizo is roasting, cook the pasta in a saucepan of salted boiling water for 10–12 minutes or until al dente. Drain and keep warm. Add the olive oil, lemon rind and garlic to the pan and cook for 1 minute. Return the pasta to the pan with the chorizo, tomato, salt and pepper and toss to combine. Divide the pasta between plates and top with the mozzarella, parmesan and fried basil leaves to serve. Serves 4.